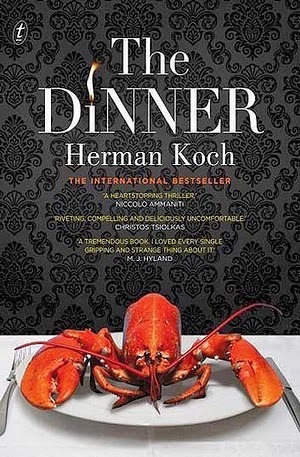 I found Herman Koch's The Dinner highly engaging almost until the very end of the novel. Which was where the trouble started. But I'll get to that. The premise is immediately digestible – the parents of two boys meet over a five-course restaurant dinner to discuss a terrible crime their sons have committed. It came as no surprise that Christos Tsiolkas of The Slap fame provided the cover quote on the Australian edition. His novel had an equally engaging set up and dealt with the unchecked secrets within a family and the damage they inflict. However, that is where the comparisons end. Where Tsiolkas's novel is essentially social realism (with occasional notes of melodrama), Koch is writing what initially appears a satirical piece. His background as a playwright is also evident in his using one location and a small cast of characters. Where things start go awry is Koch's unsubtle efforts to conceal the crime from the reader. It's a testament to his skill as a writer that the book is engaging even though Paul, the first person narrator, actively withholds information. And it's the promise of discovering this crime (and a very dry sense of humour) that keeps the narrative moving along. Alas, once things are out in the open, despite best efforts, the final third of the novel doesn't hold up. The humour falls away, Paul's motivations are exposed as being those of a borderline sociopath and the satirical promise of broader social commentary evaporates into a strange kind of a-political libertarianism. Ultimately The Dinner is missing a consistent or evolving approach to its over-aching social analysis, something that Tsiolkas and Michelle Hollebecque, a writer who also deals with curmudgeonly apolitical-ness, do much better. None of this is to say that I didn't enjoy The Dinner. I read it in two days, but I ultimately felt as though my expectations were raised but never fully satisfied.